This quickstart demonstrates how to connect to an Azure Database for MySQL using the MySQL Workbench application. Download and install MySQL Workbench on your computer from the MySQL website. Get the connection information needed to connect to the Azure Database for MySQL. You need the fully qualified server name and login credentials. From the left-hand menu in Azure portal, click All resources, and then search for the server you have created (such as mydemoserver). From the server's Overview panel, make a note of the Server name and Server admin login name. If you forget your password, you can also reset the password from this panel. Launch the MySQL Workbench application on your computer. Connection Name Demo Connection Specify a label for this connection. Connection Method Standard (TCP/IP) Standard (TCP/IP) is sufficient. Hostname server name Specify the server name value that was used when you created the Azure Database for MySQL earlier. Our example server shown is mydemoserver.mysql.database.azure.com. Use the fully qualified domain name (*.mysql.database.azure.com) as shown in the example. Follow the steps in the previous section to get the connection information if you do not remember your server name. Port 3306 Always use port 3306 when connecting to Azure Database for MySQL. Username server admin login name Type in the server admin login username supplied when you created the Azure Database for MySQL earlier. Our example username is myadmin@mydemoserver. Follow the steps in the previous section to get the connection information if you do not remember the username. The format is username@servername. Password your password Click Store in Vault... button to save the password. Click Test Connection to test if all parameters are correctly configured. Click OK to save the connection. 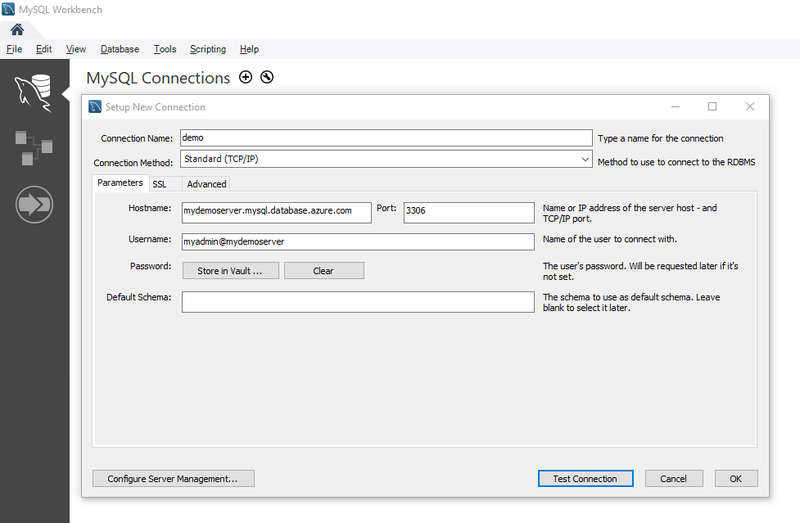 In the listing of MySQL Connections, click the tile corresponding to your server, and then wait for the connection to be established. A new SQL tab opens with a blank editor where you can type your queries. By default, SSL connection security is required and enforced on your Azure Database for MySQL server. Although typically no additional configuration with SSL certificates is required for MySQL Workbench to connect to your server, we recommend binding the SSL CA certification with MySQL Workbench. For more information on how to download and bind the certification, see Configure SSL connectivity in your application to securely connect to Azure Database for MySQL. If you need to disable SSL, visit the Azure portal and click the Connection security page to disable the Enforce SSL connection toggle button. Copy and paste the sample SQL code into a blank SQL tab to illustrate some sample data. This code creates an empty database named quickstartdb, and then creates a sample table named inventory. It inserts some rows, then reads the rows. It changes the data with an update statement, and reads the rows again. Finally it deletes a row, and then reads the rows again. 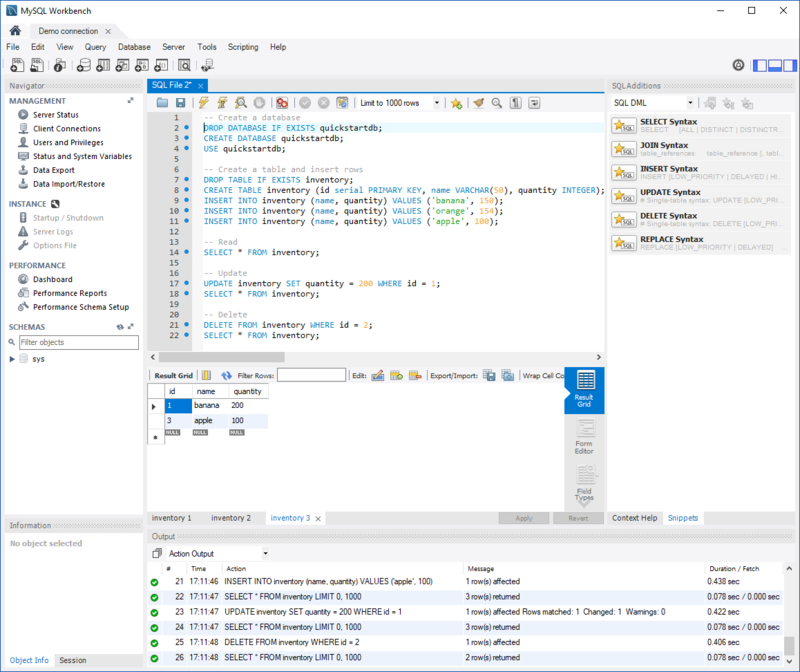 The screenshot shows an example of the SQL code in SQL Workbench and the output after it has been run. To run the sample SQL Code, click the lightening bolt icon in the toolbar of the SQL File tab. Notice the three tabbed results in the Result Grid section in the middle of the page. Notice the Output list at the bottom of the page. The status of each command is shown. Now, you have connected to Azure Database for MySQL by using MySQL Workbench, and you have queried data using the SQL language.